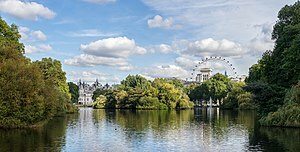 St. James's Park. Formed and walled in by Henry VIII, transformed by Charles II and much modified by George IV. The diary has many references to its use by the King and his circle, to the degree of semi-privacy preserved there, and to the great alterations in its lay-out made in the '60s, but no set of plans of those alterations has yet appeared. It contained at this time a lake and canal, a physic garden and several deer-houses. St James Park was next to St James Palace (now long-gone) and very near to Pepys' office. You will find these and other maps at "BACKGROUND INFORMATION / GENERAL REFERENCE / MAPS / MAPS OF LONDON"
St James Park and rest of city 173? Also pages of description of London town . A regular tour guide for "Toute de mondo popoli including the commutors rushing from black fryers ste" It may be 70 years later. London of the 1940's is closer to SP than changes that have come to be 'til now (the 21st c), since first I went prancing down the mall to Buck. Pal. Glyn is somewhat precipitate to describe St. James's Palace thus, since it still stands, close to St. James's Park, sandwiched between The Mall and Pall Mall - where it can be seen on the second map referenced by Glyn. the official site of the Park with some history of the birds and a passport picture of a Pelican. "It was [...] in St. James's Park the Duke of York, meeting John Milton one day, asked him if his blindness was not to be regarded as a just punishment from heaven, due to his having written against the martyred king. "If so, sir," replied the great poet and staunch republican, "what must we think of his majesty's execution upon a scaffold?" To which question his royal highness vouchsafed no reply." The Canada goose is a native of the American Atlantic seaboard, and records purport it to have been introduced to England by King Charles II (or more likely a collector), around 1660, having acquired a number of birds as additions to his wildfowl collection in St James's Park, London. Due to this Royal connection it soon became popular in country gardens with lakes and ponds across England, especially due to its striking plumage and call. It became a wildfowl staple with landed gentry and country estates. Surprisingly, despite its popularity, the first recorded entry for breeding does not occur until 1890. However, this may be the first wild breeding record, rather than captive. The records do not give a distinction. The Canada goose has taken 200 years to spread nationally, via escapees, released birds and possibly human intervention (see pest control below), in the wild and become acknowledged on the British list as a native bird1. James's (St.) Park, a park of 58 1/2 acres (shaped not unlike a boy's kite), originally appertaining to the Palace of St James's. It was first formed and walled in by Henry VIII., replanted and beautified by Charles II. What Cavalier would know St James's Park? And wild ducks quack where grasshoppers did sing." Waller describes in pretty if somewhat languid and diffuse verse his vision of the charms of completed St James's, -- the groves with lovers walking in their amorous shade; the gallants dancing by the river's side, where they bathe in summer and in winter slide; the crystal lake in which a shoal of silver fishes glide, while laden anglers make the fishes and the men their prize. London: the Old Horse Guards from St James's Park. Canaletto, 1749.